If for any reason you are dissatisfied do first reach out to us and give us an opportunity to set things right. So do give us an opportunity to provide a faster resolution for any issue you may face.”. 14K Yellow Gold Wt :- 1.03 gm. Diamond Wt :- 0.22 Ct. Size :-9 mm. Condition These earrings are in a very good condition. Diamond - Round Cut - G / VS2 - 1.00ctw (approx). Gold Chains. Always fast & free unless otherwise stated. Collectors Coins & Jewelry has been family owned and operated on Long Island, NY since 1946. Exquisite 1.15 Carats Natur al Diamond 14K Solid Yellow Gold Hoop Earrings. Earrings have safety lock. These earrings are in perfect condition and look like new. Total Earrings Weight is: 6 grams. Total Natural Round Cut White Diamonds Weight : 1.15 Carats (color G / Clarity VS2-SI1). This beautiful and brilliant pair of diamond cuff earrings is crafted in solid 14k yellow gold and features 66 round brilliant cut diamonds. Each earring contains 3 vertical channels of 11 diamonds which run from the very top of the earring to just before the earring starts to bend up under the ear. 18K Hollow Yellow Gold Snap Closure Hoop Earrings. Clarity: VS2 - SI1. 18K yellow gold earrings weigh together 3g. Earrings are in excellent condition. 126 round diamonds, total weight 0.85ct. Snap closure. 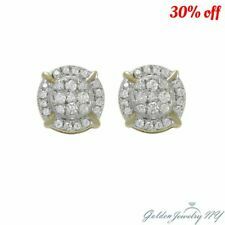 1.00 Carat Natural Diamonds in 14K Solid Yellow Gold Screw Back Stud Earrings. Clarity: VS2. EARRINGS WEIGHT IS 1.4 gram. Gold Purity: 14k. 1.00 Carat Total Diamond Weight. Elongated Hoop, Comfort Lever closure. Natural diamonds. Rounds, Full cut brilliants. G- color Vs-2 Clarity. Here is a Fine Diamond Pave Heart Shape Earrings. Made from Solid 14Kt Yellow Gold and weighs 7.1 grams. It holds 104 Natural Round Brilliant Diamonds that add to 1.00Ct G - H Color VS2 - SI1 Clarity. Each earring features a 0.41 carat round brilliant cut diamond prong set at its center surrounded by a halo of 15 shared-prong set round brilliant cut diamonds. Stone(s):(2) Natural Genuine Diamonds - Round Brilliant Cut - Prong Set - SI2/I1 Clarity - G Color - 0.81ctw (approx.). Main Stone Clarity: VS2 - SI1. Main Stone: Genuine Enhanced Diamond. Shape: Round. Total Carat Weight: 1.04CT. 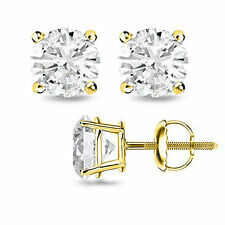 A pair of diamond studs is an essential indulgence for any lady or gentleman of bearing. Rarely have style and practicality co-existed in such harmony as in our stunning design. This beautiful pair of stud earrings encompass 2 round diamonds weighing approx. Setting: 18K yellow Gold. Diamond Earrings. CLARITY: VS2. These diamond earrings are set with 1 carat of Round brilliant cut diamonds mounted in 18K white or yellow gold. Diamond Pendants. Diamond Rings. A stunning 14k yellow gold modern style stud earrings features two round brilliant diamonds with a total weight of 1.01 carat (approx 0.51ct each). These diamonds were graded by AGI labs as a 100% Earth Mined Diamonds, F color, VS2 clarity enhanced and Excellent Polish. To expose the true sparkle of the earrings our goldsmith used bezel setting. 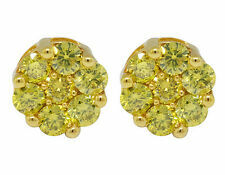 These earring will arrive with a detailed grading certificate and with a retail value of $3,488. At Diamond BLVD, your satisfaction is guaranteed and your money is fully protected by our 30-Days 100% money back policy. Here is a Fine Round Cut Diamond Hoop Earrings. Made from Solid 18Kt Yellow Gold and weighs 5.2 grams. It holds 24 Natural Round Brilliant Diamonds that add to 1.00Ct G Color VS2 Clarity. Earrings are 19.5mm tall. Earring Shape / Style. A stunning pair of studs featuring exquisite diamonds in a fascinating cluster. Crafted in warm10K yellow gold, this pair features a round-cut solitaire diamond is embraced by a flower-shaped cluster. The diamonds are pave set over a20mm x 10mm wing silhouette and add a glorious sparkle to the earrings. So ethereal, its hard to believe these angel wing earrings are earth-bound. Black Diamonds. Blue Diamonds. ESTATE 18K GOLD 1.1 CT DIAMOND CHANDELIER EARRINGS. SOLID HEAVY 18K YELLOW GOLD. "18K" "750" "1.10 CT". SO YOU CAN BE ASSURED OF THE EXACT SPECIFICATIONS OF THESE EARRINGS. G-H COLOR AND VS CLARITY NATURAL DIAMONDS. Diamond Earrings. Diamond Bracelets. Ladies Diamond Bracelets and Bangles. Diamond Necklaces. Diamond Charms. Diamond Crosses/Jesus Pendants. Heart Shape. The diamond setting includes 9 round cut diamonds set in an invisible setting. Diamond Semi Hoop / Larger Huggie. G-color, Vs-2 clarity. Rounds, full cuts. From Our exclusive Designer Collection, these 14k yellow gold martini style earrings features two round brilliant diamonds with a total weight of 1.00 carat (approx 0.50ct each). These diamonds were graded by AGI labs as a Natural Earth Mined Diamonds, E color, VS2 clarity enhanced and Ideal Polish. To bring out the radiance of the earrings our master jeweller used 3-prong setting. The certificate that comes with These earring indicates the 4C's and the appraised retail value of $4,205. At Extra Brilliant, your satisfaction is guaranteed and your money is fully protected by our 30-Days 100% money back guarantee. Main Stone Clarity: VS2 - SI1. Main Stone: Genuine Enhnaced Diamond. Shape: Round. Total Carat Weight: 1.04CT. Undeniably elegant, these 14k yellow gold modern style stud earrings showcases two round brilliant diamonds with a total weight of 1.05 carat (approx 0.53ct each). These diamonds were certified by AGI laboratories as a 100% Natural Diamonds, J color, VS2 clarity enhanced and Very Good Polish. To emphasize the true brilliance of the item our jewelry designer chose bezel setting. The certificate report accompanied with These earring states the characteristics of the diamond and with estimate retail value of $3,369. At Diamond Traces, your satisfaction is guaranteed and your money is fully protected by our 30-Days 100% money back guarantee. Beautifully hand crafted, these 14k yellow gold basket style stud earrings showcases two round brilliant diamonds with a total weight of 1.21 carat (approx 0.61ct each). These diamonds were certified by AGI laboratories as a 100% Natural Diamonds, I color, VS2 clarity enhanced and Ideal Polish. To emphasize the true brilliance of the item our jewelry designer chose 4-prong setting. The certificate report accompanied with These earring states the characteristics of the diamond and with estimate retail value of $5,212. At Diamond Traces, your satisfaction is guaranteed and your money is fully protected by our 30-Days 100% money back guarantee. A beautiful 14k yellow gold martini style stud earrings features two round brilliant diamonds with a total weight of 1.15 carat (approx 0.58ct each). These diamonds were certified by AGI laboratories as a 100% Natural Diamonds, E color, VS2 clarity enhanced and Ideal Polish. To emphasize the true brilliance of the item our jewelry designer chose 3-prong setting. The certificate report accompanied with These earring states the characteristics of the diamond and with estimate retail value of $7,332. At Diamond Traces, your satisfaction is guaranteed and your money is fully protected by our 30-Days 100% money back guarantee. MOVIE CLASSIC style earrings. These spectacular "Button" style earrings contain two beautiful white mother of pearl scintillating 13.5MM Round Natural Mother of Pearls (great quality: very smooth with soft warm glow. ). Yurman 750 . David Webb. Gold Charms. Silver Jewelry. Diamond weight.. Approx 1 carat. Diamond quality. VS-G. Our exceptional reputation matters most to both us and you …. Hand-crafted by top designers, these 14k yellow gold classic style stud earrings features two round brilliant diamonds with a total weight of 1.11 carat (approx 0.56ct each). These diamonds were graded by AGI labs as a 100% Earth Mined Diamonds, F color, VS2 clarity enhanced and Very Good Polish. To expose the true sparkle of the earrings our goldsmith used 6-prong setting. These earring will arrive with a detailed grading certificate and with a retail value of $5,000. At Diamond BLVD, your satisfaction is guaranteed and your money is fully protected by our 30-Days 100% money back policy. An elegant creation, these 14k yellow gold basket style earrings showcases two round brilliant diamonds with a total weight of 1.19 carat (approx 0.60ct each). These diamonds were graded by AGI labs as a 100% Earth Mined Diamonds, D color, VS2 clarity enhanced and Excellent Symmetry. To expose the true sparkle of the jewelry our goldsmith used 4-prong setting. These earring will arrive with a detailed grading certificate and with a retail value of $7,813. At Diamond BLVD, your satisfaction is guaranteed and your money is fully protected by our 30-Days 100% money back policy.